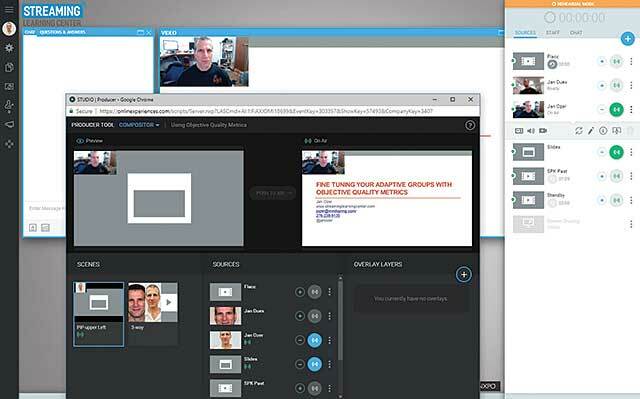 Inxpo Studio is a great-looking, well-featured webinar platform with outstanding QoE functionality and ease of use. If you’re looking for a webinar platform for marketing, sales, training, or similar functions, Studio should definitely be on your short list. Studio comes in two versions: Webcast Studio and Broadcast Studio. Webcast Studio is designed to provide the basic talking- head webinar experience, with a single speaker talking over slides. Broadcast Studio adds multiple-source streaming, picture-in-picture video over slide presentation, and social streaming to Facebook Live and YouTube Live. Both systems have APIs you can use to pull registration data into your own marketing systems, insert a paywall for pay-per-view events, or pull analytics after the event. Studio has integrations with platforms like Marketo, Eloqua, and Salesforce to simplify data sharing with these systems. Studio can also create a paywall for you that accepts payment via PayPal if you don’t have your own paywall. Both systems can produce live presentations, which you can then convert to on-demand, and simulive, which plays the content from a previous webinar with live windows for Q&A, chat, and other audience interactions. Both are also fully brandable. West, the company that acquired Inxpo in October 2018, doesn’t publicly reveal its pricing schedule, but this is a premium product aimed at the higher end of the market and well-positioned to compete on features and performance in that category. We tested the Broadcast Studio experience, as you can tell from the two videos to the right of Figure 1. Figure 1. Here’s the webinar we produced with the help of Unified Patents COO Shawn Ambwani. Since we’re here, let’s review the viewer’s interface shown in Figure 1, which is highly configurable, as you’ll learn below. The big window on the right contains the PowerPoint slides and two speaker videos and is the window that gets recorded by the system for use for video on demand (VOD), simulated live, or other purposes. Note that I could have deployed a background image in the frame to eliminate the letterboxing atop and below the PowerPoint slides. If you distribute videos and PowerPoint slides in separate windows, the system will record only one of them, but you can use an integrated Camtasia-like screen recorder to capture the multiple windows. Back to Figure 1. On the left are windows for chat and Q&A, with buttons on the bottom to access downloadable materials and speaker bios, or to open and close the various panels. In this configuration, you can customise which windows are open and their placement, and either lock it down or allow viewers to rearrange windows to their liking. time, as well as identifying the webinar staffers and the roles they will play. Each staffer gets a separate login address you send them before the event. You can see the list of options configured during this stage on the left of Figure 2, which includes creating the registration page, messaging to your registrants, uploading presentation slides and handouts, and creating polls and quizzes; for the latter, you can score and then deliver a certificate to those who pass. Figure 2. Basic setup wizard on the left; here’s where you choose display layout. During this process, you set the resolution, frame rate, and data rate of each source video stream so you can match incoming quality with the outbound bandwidth at the source site. During the presentation, Studio monitors all incoming streams and will adjust these settings downward if the video isn’t getting through from one of your speakers. This is one of several key QoE features in the platform. The platform does an excellent job preconfiguring options to simplify operation and deployment. For example, if you add an abstract to your webinar description and choose to include staff bios in the registration page, your registration page should be 99 percent complete, other than choosing the mandatory fields for the registrants to enter and adding branding. Ditto for the messages you’ll want to send your registrants before and after the event. The system includes an automatic registration confirmation, plus multiple reminders, a “now open” message, and canned emails for those who attended and those who missed the event. While you can customise these messages if desired, they’re functional as is; if you’re in a hurry, you can simply choose a time and date for their transmission, and the system handles the rest. The last stage of webinar configuration in Broadcast Studio is choosing the layout as shown in Figure 2. In essence, this is the template into which you’ll add different media types during the next stage of the configuration process. I chose template 2 shown on the right of Figure 2. This includes one large window on the right for slides and the talking heads, which is the window recorded by the system, plus chat and Q&A dialogs on the upper left. To finalise your presentation, rehearse, and go live, you’ll enter the Presenter Console shown in Figure 3. Figure 3. The two interfaces for controlling content in Studio. In the Presenter Console, you’re in rehearsal mode until you take the webcast live via a large Start Webcast button (not shown in Figure 3, as we were in Rehearsal Mode). This gives you plenty of opportunity to test your incoming media connections, arrange your inputs, upload slides or videos, create polls or quizzes, or simply rehearse. 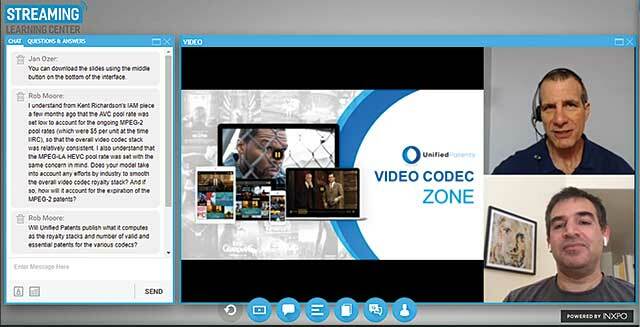 Studio can input a range of media types, including screenshare; VOD videos; live videos from a webcam, video conferencing terminal, or live encoder; or dial-in audio. There are two content control interfaces, both shown in Figure 3. In the back is the control interface available with both Studio versions; the Producer tool shown in the foreground is available only in Broadcast Studio. Take a quick look at the top right of the background frame in Figure 3, where you see all the various inputs and content configured into the presentation. I know it’s tiny, but hopefully you can see what I’m talking about. With Webcast Studio, you can only display a single video at a time, so taking any video source live will replace the previous video. With Broadcast Studio, the plus sign next to each input adds it to the presentation in a default way that you can’t change. For example, if you add two videos and the PowerPoint slides, you get the configuration shown in Figure 1. If you click the minus sign to hide one of the videos, the other gets composited over the bottom right edge of the slides, potentially obscuring some content (in which case, you can hide the video and continue audio only). If you hide the slides, the two webcam inputs come up side-by-side, filling the available frame. In most cases, the default view works fine, but you can’t change it. In essence, in Broadcast Studio, the Producer tool in the foreground of Figure 3 lets you override the default view and create unique screen configurations that you can swap in and out like a cloud-based TriCaster. For example, on the bottom left of the foreground of Figure 3, I have two scenes configured, one of a three-shot and the other of slides with video on the upper left, which is the one shown live on the right in the foreground. You configure these by choosing an available template in the tool and dragging content into open slots, or Studio can create custom templates for you. To take a scene live, you click the scene on the left and then the Push to Air button between the preview and live window. You can activate the display layers on the lower right the same way: click the content and then Push to Air. Beyond creating scenes, you can also input overlays like titles and bugs and apply them during the presentation. Featured Articles: Hey, Streaming Industry: Fix This!